Thousands of people flooded Montreal’s streets Saturday, Sept. 14, to protest against the Parti Québécois’ proposed Charter of Quebec Values, which would “prohibit the wearing of overt and conspicuous religious symbols by state personnel.” The route taken spanned over two kilometers down de Maisonneuve Blvd. from Place Émilie Gamelin (UQAM) to Place du Canada. Protesters donned multiple religious symbols, such as hijabs, kippahs, and crucifixes through the downtown core in a march to voice their opposition to the controversial legislation. 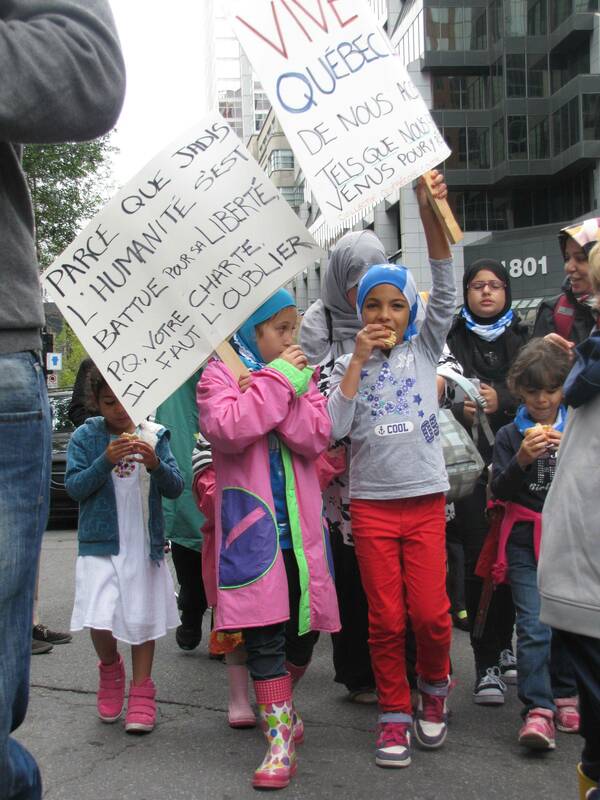 The crowd chanted slogans such as “PQ values are racist values” and “No to the charter of hate”. Many took to shouting “Quebec is not France”, referring to the 2004 French law that banned veils, crosses and turbans from state schools, in addition to the 2011 law that banned the niqab in public places. Others agreed that the proposed charter is not only infringing on the rights of religious minorities, but was racist as well. Participants repeatedly took to shouting “Marois: racist”, an accusation that many did not approve of. André Lévesque was one of the few seen carrying a crucifix to the protest. “I don’t want anyone telling me how big I can wear my cross,” said Lévesque. Marois has previously said that the crucifix in the National Assembly in Quebec City would not be removed under the new rules. A poll by survey firm SOM places support for the charter at 66 percent, or two-thirds of all Quebecers, according to CBC News. However, opponents of the charter are willing to fight the legislation, should it pass. Binge watching: We want all of TV now!